I've been taking the year-long LifeBook 2014 online course hosted by Tamara LaPorte at Willowing Arts. The course has a wide variety of contributors. 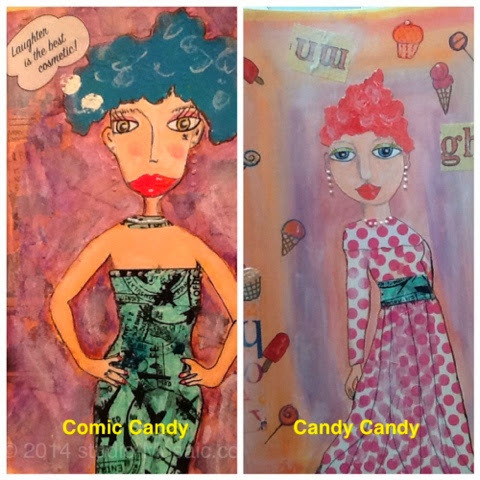 Cotton Candy Gals were inspired by Marieke Blokland's LifeBook 2014 tutorial. When I first saw this class, I thought, "Uhoh, am I going to like this?" The answer ended up being "YES". No matter what I already know, I ALWAYS learn something new and fun with an online course, so I highly recommend trying them. Tam is very generous with the pricing and quality of LifeBook 2014, so jump in.....the gals are prodding you on! !